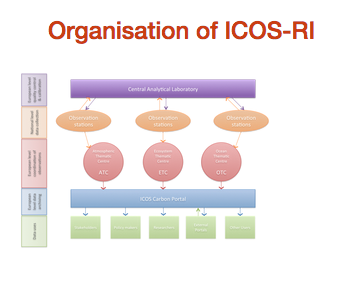 The Integrated Carbon Observing System (ICOS) is a European Research Infrastructure (RI). A RI refers to facilities, resources and related services used by the scientific community to conduct top-level research. RI’s may be RIs may be ‘single-sited’ (a single resource at a single location), ‘distributed’ (a network of distributed resources), or ‘virtual’ (the service is provided electronically). CERN, the world’s largest particle physics laboratory is an example of a well-established research infrastructure. 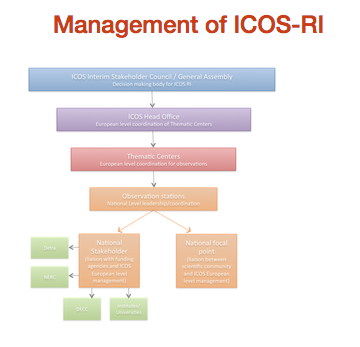 ICOS-RI was created because it was considered important to establish a sustained greenhouse gas observation system to enable high quality climate change research and increase usability of the research data. The mission of ICOS Research Infrastructure is to enable research to understand the greenhouse gas budgets and perturbations. Track carbon fluxes in Europe and adjacent regions by monitoring the ecosystems, the atmosphere and the oceans through integrated networks. Provide the long-term observations required to understand the present state and predict future behaviour of the global carbon cycle and greenhouse gas emissions. Monitor and assess the effectiveness of carbon sequestration and/or greenhouse gases emission reduction activities on global atmospheric composition levels, including attribution of sources and sinks by region and sector. Carbon dioxide (CO2) release to the atmosphere by human activity, including fossil fuel combustion, cement production and changes in land use patterns, has resulted in a 40% increase in atmospheric CO2 concentration, from 280 ppm (parts per million; equivalent to μmol mol-1) in preindustrial times to 400 ppm today. This increase has caused a measurable increase in global surface temperature, with significant consequences for human wellbeing predicted to occur when temperature increases exceed 2°C (from pre-industrial times), a threshold likely to be broken this century. CO2 is not the only gas to cause radiative forcing of the climate. Methane (CH4), nitrous oxide (N2O) and a range of other greenhouse gases (e.g. SF6, NF3, (PFCs (perflurocarons), CO and H2) also play direct and indirect roles in atmospheric warming. These are collectively known as greenhouse gasses (GHGs). The rate of increase in atmospheric GHGs would be significantly larger (and the time when the 2°C threshold is breached would be significantly sooner) had the ocean and terrestrial ecosystems not had the ability to absorb much of the emitted gases. Most recent scientific analyses estimate that roughly 56% of CO2 emitted to the atmosphere has been absorbed by the oceans and terrestrial ecosystems over the past decade (Le Quéré, C et al. (2015). "Global carbon budget 2014." Earth Syst. Sci. Data 7(1): 47-85). In the case of the oceanic absorption, this is causing a decrease in the observed pH of the surface ocean. This is known as ocean acidification and is predicted to have major, mostly detrimental, impacts on marine ecosystems. The nature, stability and persistence of the terrestrial and ocean carbon sinks, together with our emissions’ policy, will regulate the future evolution of our climate, and the impacts on marine and terrestrial ecosystem function.